FROM THE RECTOR On Friday 4th March World Day of Prayer took place here in St. Maelruain’s as the RC Diocese were having prayers in their parishes that night, in preparation for their ‘Opening the Door of Mercy’ conference that weekend. Rev. Avril Bennett preached and Joyce Smart played the organ. Thank you to Valerie for organising the service as usual. We had coffee at the back of the church following the service which had proved to be successful after our Diocesan Come and C service in February. I attended the end of the local RC Deanery meeting and joined them for lunch in St. Mary’s Priory. It was an opportunity for me to offer my condolences on the recent sudden passing of Brother Michael Neenan. Now and Then’s production of ‘Godspell’ took place from Tues 8th - Fri 11th in St. Mary’s Priory. It is really a joint production with members of our congregation taking part both on stage, in the choir and back stage. They also use our facilities in the run up to ‘show time’ both for rehearsals and planning meetings. It was a great success and thoroughly enjoyed by all involved including the audiences! March continued along with our Lenten BACI series on each Wednesday of Lent along with a well attended service on St. Patrick’s day. We had services each day of Holy Week and celebrated Easter in our beautifully decorated church. Thank you to Regina Donoghue, Vivienne Bright and their helpers for doing such a fantastic job with their creative floral displays. I would also like to thank Regina and Vivienne for the beautiful posies they presented to all the ladies in the congregation on Mothering Sunday. 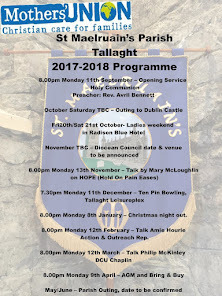 On Saturday 19th there was a ‘Date Night’ run by the seven churches who organised the Alpha Course and the ‘Concert of Hope’ to support marriages. The event was held in a local African Church with two churches doing each course for the dinner. We were on ‘tea, coffee and tray bakes’, thank you to Gail Sheridan and Saule Cameron, pastoral worker from St. Thomas’, Jobstown, for their help. Along with dinner there were brief talks on marriage and each couple was given an envelope with conversation starters with ‘Mr and Mrs’ style questions. It was an enjoyable evening which continued with a short dance. On Sunday 20th following our family service, tea and coffee was in aid of parishioner Anthony Nwanze school trip to Mumbai. Rockwell College are taking a group of students to Mumbai in aid of the Irish Charity ‘Local Lives’. We had a donation of two beautifully hand crafted Easter eggs, made by the culinary arts department of the ITT College. Unfortunately as they didn’t sell at the family coffee Anthony brought them home and raffled them off on his road with the funds raised going to the trip. Magda Manly had hand crafted lovely crocheted dolls with Easter Eggs inside, one of which was sold at family coffee in aid the trip and the others raffled on Anthony’s road. Good luck to Anthony! On Sunday 3rd April the Flower Festival Committee presented the parish with a new Holy Communion Chalice and two bible stands. Thank you to the committee not just for these gifts but also to reiterate our thanks for the re roofing the stable and the defibrillator for the Parish Centre. THAI DINNER David Gibson will give a report on his recent Mercy trip to Thailand with a thank you Thai dinner in the small hall on Sat 16th April at 7.00pm. Please phone 086 101 8860 if you would like to attend to give an idea of numbers for catering. They also run a charity shop MANNA in Brookfield Enterprise Centre and welcome any household items and clothing in good condition. Contact Linda at 087 2392409. Our AGM and Bring & Buy will be held on Monday 11th April when we will also arrange our summer outing. Mother’s Union Holy Communion and Tea Party for indoor members in St. Bridget’s, Stillorgan on Saturday 23rd April at 3.00pm. SONGS OF PRAISE There will be a ‘Favourite’ Songs of Praise with introductions in Taney Church on Sunday 17th April at 7.00pm. GIRL’S BRIGADE The annual 26th Company St Maelruains Girls' Brigade display will take place on May 7th at 3pm in the Parish Hall. It promises to be a great show for all the family. So if you'd like to see the type of dancing and singing that we do, why not come along. 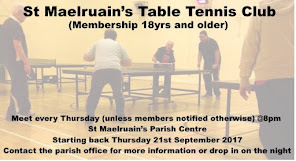 TABLE TENNIS It's hard to believe we are nearly at the end of another table tennis year. We will be starting to play off for the trophies next week, all being well. Following the play offs, hopefully we will have our night out, postponed since Christmas. We would like to express our condolences to Tommy Dunne whose mother passed away at the end of March. FLOWER GUILD Thank you to the ladies that turned out to help decorate the Church for Easter. Your help was much appreciated and I think everyone would agree that the Church looked lovely for Easter Sunday. Thanks to Percy Griffin who arrived with a selection of beautiful yellow flowers and to those who left flowers with Hazel for us. Thanks also to Valerie, who, as usual, provided us with tea, coffee and biscuits as we worked. We would welcome new people who would like to join us on the flower rota. It involves providing flowers, with another person, once a year as it stands and helping to decorate the Church at Christmas, Easter and Harvest. No experience necessary at all, just the willingness to help out! ST. MAELRUAIN’S FLOWER FESTIVAL On Sunday, April 3rd, the flower festival committee were delighted to present the parish with a new Communion Chalice. Over, the last three years, since the festival took place, various work has been carried out and different items have been purchased with the money that was raised by the flower festival. The first thing done was to plant Spring bulbs all around the Parish Centre to brighten the area . Next, the roof on the stables was replaced, as the roof was in bad repair, leaking and unsafe. A defibrillator was bought for the parish centre and one person from each parish organisation was trained in it's use. We hope nobody ever needs the defibrillator, but it's wonderful to know it is there if anybody is in trouble. We would like to thank John Doran from Blessington who made the two stands for the Bibles that sit on the organ. He did a great job on them and they are very suitable to hold the Bibles correctly. Our final purchase was the Communion Chalice which we hope the Parish will have and enjoy for many years to come. The presentation last Sunday was a lovely way to bring the flower festival to a final close. Miriam Gibney, Carol Laughlin, Mary Lucas and Patricia Slack would like to thank all the helpers, of which there were many, for all the hard work over that sunny week end in September 2013. It was a pleasure to have been involved with the project and many friends were made through the festival. BOWLS Our bowling club won the Gordon Miller Memorial trophy in Greystones beating Whitechurch bowling club in an exciting final for the second year in a row. Well done to all players and subs. We are coming to the end of our league Matches. WHIST DRIVE The April Whist Drive is on Monday 17th at 8.00pm in the Small Hall. All Welcome! 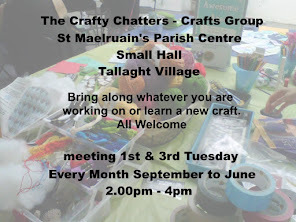 CRAFTY CHATTERS Crafty Chatters meet on the first and third Tuesday of each month at 2.00pm in the small hall. Come along and bring whatever craft you are working on or learn a new one! A warm welcome awaits all. PARISH COFFEE Thank you to everyone who came to our coffee morning on the 1st April. The donations on that day totalled €126.50, and will be given to the Alice Leahy Trust for the Homeless. Many thanks again. 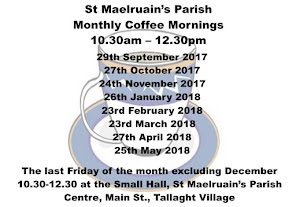 Our next Coffee Morning will take place as usual on the last Friday of the month, 29th April at 10.30am. At present we are missing Benny Myers, one of our stalwart regulars, due to illness, and we send our best regards and hope to see you back soon. Another of our folk missing in action is Carol Laughlin, hope you too are on the mend and will able to join us again soon. 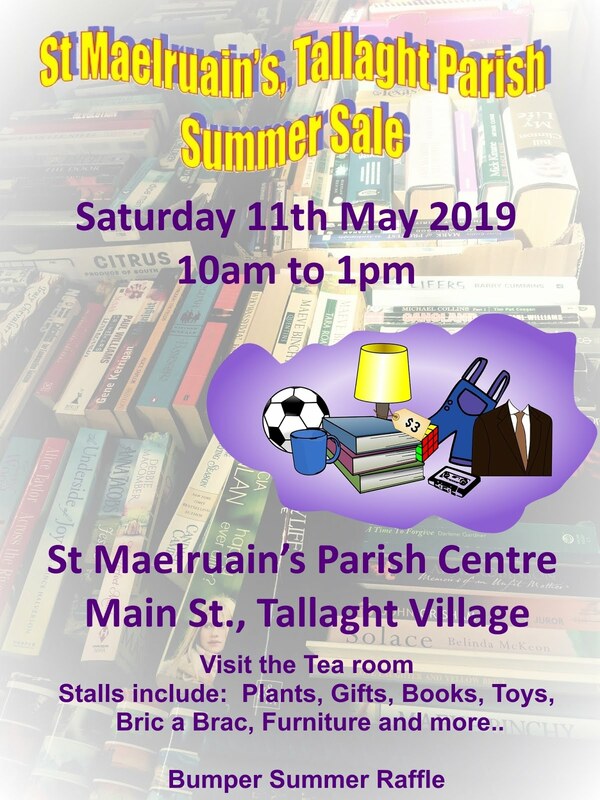 DATE FOR YOUR DIARY The SUMMER SALE will take place on Saturday 28th May in the Parish Centre. Please do what you can to make this fundraiser a success! Please attend on the day, buy raffle tickets, donate prizes and items for the sale.